A TRAVÉS DE LA METRALLA. 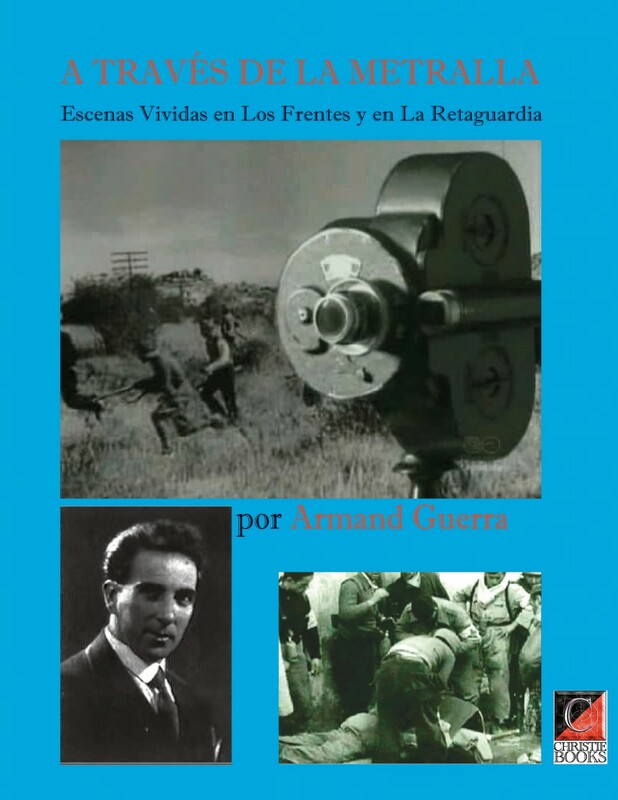 Escenas Vividas en Los Frentes y en La Retaguardia por ARMAND GUERRA. Las memorias personales de un cineaste anarquista de la guerra civil entre 18 de Julio y Deciembre 1936. ESTÍVALIS CABO, José María: Más conocido como Armand Guerra. A veces citado como Estívalis Calvo y Gerard Guerra. Liria (Valencia), 4-1-1886 / París (Francia), 10-3-1939. Hijo de campesinos educado en la religión, fue monaguillo y seminarista hasta su total ruptura con la divinidad para dedicarse a la imprenta (desde los trece años) y al teatro y más tarde al cine en el que destacará en todas sus facetas (director, guionista, actor, etc.). Su pertenencia al movimiento anarquista es antigua. Preso en 1907 a consecuencia de una huelga de tipógrafos, es posible que anduviera un tiempo por las Antillas antes de recalar con un hermano en París (1908). Tras la Semana Trágica de 1909, sacó algunos números del suspendido Tierra y Libertad en Niza y mantuvo contactos con Vallina. En los años siguientes colabora en el periódico Tierra de La Habana (1910-1914) y en Le Réveíl. En 1911 se señala su presencia en El Cairo dentro de una comunidad anarquista italiana y su participación en el periódico L’Idea y más, tarde viaja por la zona oriental de Europa (Estambul, Rumania, Salónica) ya con fama de anarquista. De nuevo en Francia, (Toulouse, Deauville), se asienta en París en los años 1913-1914, dirige películas mudas (Les miséres de l’aiguílle, Un crí dans la jungle, Le víeux docker, La Commune I) para su cooperativa Le Cinema du Peuple y en la última fecha mitinea en nombre de los anarquistas españoles. Expulsado del país galo en septiembre de 1915, seguramente por su oposición a la guerra, vive como tipógrafo en Lausana. A partir de 1917 reemprende su labor de cineasta en Madrid (funda la empresa Cervantes Films, que deja tras completar media docena de películas, entre ellas La maldición de la gitana). Parece que entre 1917 y 1920 viaja por muchos países: toda Europa (Balcanes, quizás dos años en Rusia) Turquía, Asia Menor y Aﬁrica del Norte y de seguido, tras una estancia en Lausana, ﬁja residencia en Alemania (durante doce años aunque con viajes continuos a España) y trabaja para la famosa productora UFA en todas las tareas del cine (incluidas las de traductor, hablaba siete lenguas, y actor en la película Sommernachtstraum) y en ensayos de cine sonoro (en 1926 estrenó en Valencia varios documentales sonoros). En 1926 se le encarga la producción de Luis Candelas o el bandido de Madrid, en 1927, Batalla de damas, en 1928 Die geschenke loga, en 1929 rueda Idilio nocturno, en 1930 aparece como actor en La alegría que pasa y dirige El amor solfeando protagonizada por Imperio Argentina. Son años en que además ejerce de corresponsal de Popular Film. Retorna a su país con la República, trabaja con su hermano Vicente para el Cine Popular Español (intentan montar unos estudios de cine, Estudios Hispano-Cineson, que fracasan) y forma en el grupo organizador de ACE con Lescarboura, Mateo Santos y otros. En 1936 rueda la película Carne de ﬁeras, que deja sin montar ante el estallido de la guerra para dedicarse con cámara y pluma a la defensa de la revolución confederal (rueda Estampas guerreras), mitinea por el sur de Francia (marzo de 1937 en Narbona, Perpiñán, Montpellier, Marsella, Nimes, Beaucaire, Saint Gilles, Saint Henri, La Ciotat), traduce textos al servicio de CNT y sufre la vesania stalinista. Encarcelado del 8 de abril al 26 de agosto de 1938 por el SIM (Servicio de Inteligencia Militar, de mayoría comunista) en el barco Uruguay, en el puerto de Barcelona y después bajo arresto domiciliario, escribió al Secretario General de la CNT , Mariano Vázquez, pidiéndole que interviniera para liberarlo. A ﬁnes de 1938 se hallaba en Barcelona desesperado por no recibir un pasaporte y por ﬁn consigue abandonar España en enero de 1939. Colaboraciones en El Cine, L’Indomptable, Nosotros, Popular Film, SIA, Tierra de La Habana, Umbral. Autor de A través de la metralla (Valencia, Guerri, 1938) y Stefanof (según parece perdido). Su compañera, Isabel Anglada. Otro seudónimo, éste simple, Silavitse. Existe un vídeo sobre su vida, Armand Guerra, réquiem pour un cineaste espagnol, de Ezequiel Fernández. José María Estíbalis Calvo, better known as Armand Guerra, was born in Valencia on 4 January 1886. Of his family, nothing is known about his parentage or his roots, other than that he had a younger brother, Vicente. For a time they worked as a team, but prior to the civil war in Spain, Vicente left for the Americas, for Mexico and nothing more has been heard of him. In a newspaper article my father states that his childhood was spent among priests and monks. He was an altar boy at the church of San Nicolas in Valencia before entering the seminary. In those days he believed in all the mtsyeries of religion and in an omnipotent god. Later, sickened by the behaviour of the Church’s representatives, he washed his hands of the whole lot and turned to publishing and the theatre and never again darkened the door of any church. After which, there are many obscure periods. 1913: in Paris he shot a number of silent movies such as Les misères de l’aiguille, with Musidora in the lead part; Un cri dans le jungle, Le vieux docker and La Commune I, funded by his creation, the Cinéma du Peuple cooperative. 1917: Revolution in Russia. The Bolsheviks. I have no documentation covering a period of around two years. All I know is that he spoke Russian very well. 1919 or 1920 to 1923? : Armand Guerra (as he himself wrote) was very young and keen on his profession. He roamed the whole of Europe, part of Asia Minor (shooting a documentary in Turkey) and North Africa, working in lots of different countries. 1920 or 1923 to 1932? : His German period. He was employed by UFA in its Berlin (Babelsberg) studios. He tried his hand at all sorts of film trades (titler, dubbing director, producer, cameraman, scriptwriter, actor). In 1925 he worked on the earliest ‘talkie’ ventures and presented some ‘talkie’ documentaries in Valencia in 1926. My father wrote of having lived in Berlin for twelve years, albeit constantly to-ing and fro-ing to Spain. In 1932, Hitler’s protectionist laws forced him to return to Madrid. 1932: He set up home with my mother, Isabel Anglada Sovelino (b. Madrid, 5 March 1902). 1934: I, his daughter Vicenta, was born on 21 March. 1932 — 1934: With his brother Vicente, Armand Guerra worked for the Cine Popular Español. They tried to open film studios in Valencia and Madrid but this fell through for financial reasons. 1936 — 16 July: He stated shooting Carne de fieras in Madrid. The fascist uprising had begun. Being an anarchist, Guerra was with the CNT-FAI. He finished off the movie quickly (it was never screened) in order to participate in the revolution with his own weapons — the camera and reporter’s pen. 18 July: Here begins A través de la metralla, in which Armand Guerra records his war journeys, serialised in a Madrid newspaper before appearing in book form from the Talleres Guerri (?) in Valencia and distributed by Ibérica (?). A few copies still exist in Spain, although I do not possess one. All I have are photocopies from the newspapers of the day. According to the director of Valencia University Library, the Talleres belonged to the Valencia anarchists. 27 September: Set off with his crew to shoot a great movie recording the feats of the revolution. Later this was amended to the more modest Estampas guerreras, a film that has been lost. 1937: My father evacuated us and my mother and grandmother (our entire family) to Valencia where we spent some months, Madrid being subject to lots of air raids. On 19 November he went with us to Paris on a passport issued in Valencia and then returned to Valencia to resume his work. Of his activities between November 1937 and February 1939, we know nothing. We believe that he was in Valencia and shuttling back and forth to France, but he never came to visit us, lest we be compromised. It was always his concern to keep his family safe. He arrived in Paris exhausted and sick and without papers and was recovering when he died suddenly of a stroke on 10 March 1939, aged 53. I was five years old. Armand Guerra (born José Estivalis Calvo—1886-1939), Spanish filmmaker and anarchist, fought fascism with a camera. As a 20-year old anarchist in France Guerra helps found the Cinema du Peuple film co-operative (two of his films have recently been found: The Old Docker and La Commune). Guerra was both a producer and actor in his films and used old Communards and anarchists in his films. In the 20s, Guerra worked in Berlin, then the capital of European cinema, and for the U.F.A. studios in Babelsberg until he was expelled in 1932. In Spain, he began his first full-length film Carne de fieras, a few days prior to the military rebellion in July 1936, before heading to the front with his camera to capture the heroic efforts of the Spanish working class fighting Fascism. As a journalist, Guerra chronicled his experiences in writing, and his collected articles constitute a unique view on the Spanish conflict: A travers la mitraille (1938) (Through the Shrapnel). His life is celebrated in the film, Armand Guerra: Requiem for an Anarchistic Scenario Writer by Ezéquiel Fernandez and produced by Zangra productions. In an interesting article “In Praise of Cooperation”, by V. Gómez de Enterria carried by Nº 447 of Popular Film on 14 March last, the author does me the honour of mentioning my name, recalling a piece that I had had published in the same magazine a few years ago. I thank the erudite author for his good memory, especially as it shows me that there are still some who read and remember me, something of a rarity in our movie-making community here in Spain. Now, in keeping with my chronic obsession with making jottings during my free time, I venture to offer this present article to the editors of Popular Film in the hope that, publishing offices being swamped and having no place for my prose, they may dispose of them by inserting them in some modest corner of the magazine. For a start, my congratulations to my colleague V. Gómez de Enterria for his enthusiastic encouragement of the UCCE, the existence of which was news to me, given my long-established cinematic misanthropy. The foundation of my own cooperative in Paris, to which my colleague alludes, and which went under the name of the Cinéma du Peuple (People’s Cinema) was anything but the handiwork of titans. Due to a freak of geography, the essence of it was that Paris is not on Spanish soil and thus Spaniards cannot meddle. Which is always a stroke of luck as far as ventures prospering is concerned. In the wake of a success that I had scored — permit me to discard all modesty! — as the sole Spanish actor, director and screenwriter active in Paris in 1913, with my movie Un cri dans le jungle, which I had scripted, directed and starred in, I was congratulated by Bidamant, the then secretary of the Union des Syndicats de France and he spoke to me about making movies on social themes as a means of countering the inane bourgeois nonsense that all the studios were serving up to the public. Seeing this as a chance of breathing fresh life into the movies — even then! — I put it to him that we should launch a Cooperative among the working class by offering shares at 25 francs apiece. I shall skip the details of how its rules were organised and devised, lest this article become interminable. The interesting thing is that, two months after our conversation, I was installed in the Paris studios of Lux Film in the Boulevard Jourdan, shooting my first movie for the Cinéma du Peuple Cooperative, with a budget of 500,000 francs (raised through 20,000 shares at 25 francs apiece). I should add that the shareholders included workers and employers of the most disparate persuasions, in that the object of the organisation was to make artistic films rather than political ones. Many would-be subscribers missed out on shares, such was the take-up of the issue. Our first movie — which I had the honour of launching Musidora as protagonist — was entitled Les misères de l’aiguille. It was followed by Le vieux docker and then part one of La Commune in which I directed a million people in the Pré de Saint-Gervais, making it, for its day, the very first mass movie. My literary and historical advisor was the bona fide ex-Communard and great French writer Lucien Descaves. All of the cooperative’s movies, especially La Commune, were warmly received by the public, regardless of outlook or status, making them doubly successful: artistically and commercially. The screenplay for part two of La Commune was complete when the First World War erupted and disaster struck the venture. It seems that the nationalist hordes burnt the negatives of our productions. And the outbreak of the war spelled the end of the Cinéma du Peuple production cooperative, which seemed fated to change the direction of French production methods. From that point on — I was very young and keen on my profession — I roved across nearly the whole of Europe, part of Asia Minor and Africa and worked in lots of countries. But never again did I get the chance to organise a cooperative like the one in Paris. By 1925 I was working in Berlin on the first trial ‘talkie’ films that I had occasion to present in Valencia at the start of May 1926. I lasted twelve years in the German capital until Germany’s protectionist laws regarding her film industry, strengthened further by the Hitler government, forced me back to Spain, in that in Germany, I as a foreigner had no right to work in the movie industry as I had been doing up to then. And here I remain, in this lovely country of ours, in silent contemplation of Spanish output, much of it the handiwork of amateurs who are well-intentioned but bereft of the slightest glimmer of professionalism, even as my thoughts turn to bygone times — not that long ago — when my modest abilities found a good outlet way up in the cooler areas of northern Europe. I do not want to finish this article without wishing every success to the members of the Spanish Cooperative in the mammoth task upon which they have embarked.